“Militant Evangelism” not only highlights the fact that we are at war, but it reveals that God has given us powerful weapons of warfare that ensure victory for every soldier of Christ. This teaching climaxes with a wonderful and clear revelation of what God did for us at the Cross of Calvary. If you get a grip of this revelation, you will never again be seriously tempted by the pleasures of sin, or the glitter of this sinful world. 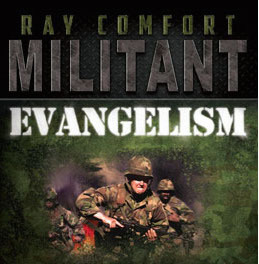 Be the first to review “Militant Evangelism (CD)” Click here to cancel reply.